In 1499, the first Guru of the Sikhs, Guru Nanak, set out from the town of Sultanpur Lodhi to begin his travels to sing the message of The One. Guru Nanak collected his songs in a small book and added the songs of saints from various faith traditions who had also known union with The One. Musical notation was not included, but the poetry was recorded along with the rāga (musical mode) in which the song had come. This collection was passed on to a succession of Sikh gurus who added their own songs and the songs of their devotees. In 1708 the collection of songs was named Siri Guru Granth Sahib, was installed as, and remains, the 11th embodiment of Guru for the Sikhs. The songs in Siri Guru Granth Sahib are organized by rāga and there are 31 rāga headings in the volume. These songs in 31 rāgas convey the body of teachings of gurus and saints. 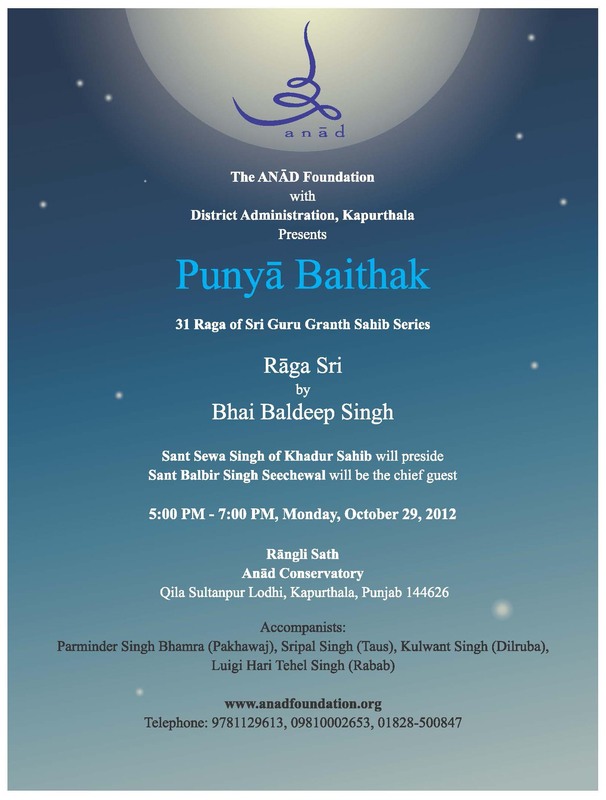 Over the next three years, Bhai Baldeep Singh, will present a series of 31 full-moon programs, a journey through each of the 31 rāgas of Siri Guru Granth Sahib. The series begins Monday, October 29 with selected songs from the first rāga, Sri Rāga. Join us under the stars at the Qila in Sultanpur Lodhi for an immersion in our musical heritage. The town is mentioned as Tamasvan in Rigved and Mahabharat, and since 500 BC was called Sarwamanpur. Known as a town of learning and the setting for spiritual discourse during the ancient Buddhist dynasties through the reign of the liberal Emperor Akbar, and the advent of Guru Nanak, it has been called Sultanpur Lodhi since the 12th century. The Qila at Sultanpur Lodhi is an ancient fort that has been home to Hindu kings, Afghan and Mughal lords, Sikh monarchs and modern police. It is now being developed by the Anād Foundation as a home for the Anād Conservatory, dedicated to the promotion and preservation of the tangible and intangible cultural heritage traditions of South Asia. 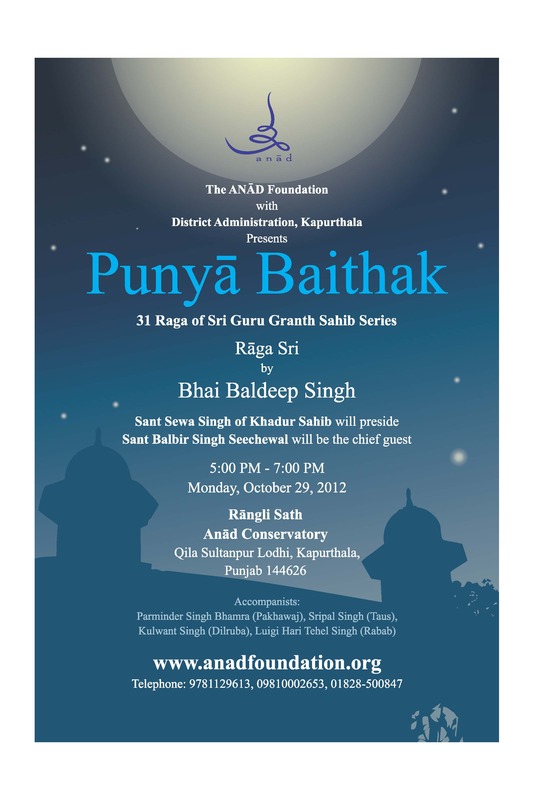 Bhai Baldeep Singh is the founder of Anād Foundation and Anad Conservatory and is a thirteenth generation exponent of the Sikh kirtan tradition. Bhai Baldeep Singh is the pioneer who, without institutional support, singlehandedly handcrafted almost all the extinct musical instruments used in the Gurbāni Sangeet, Bhakti and Sufi traditions back to life. 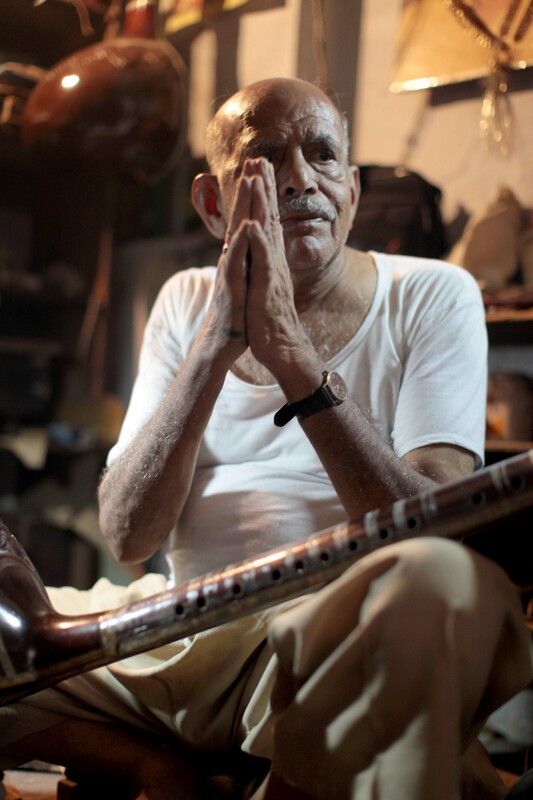 During the course of this extraordinary revival he has inspired a whole generation of Gurbāni Kirtan enthusiasts around the world and has built lifelong associations with some of the last remaining luthiers of India. 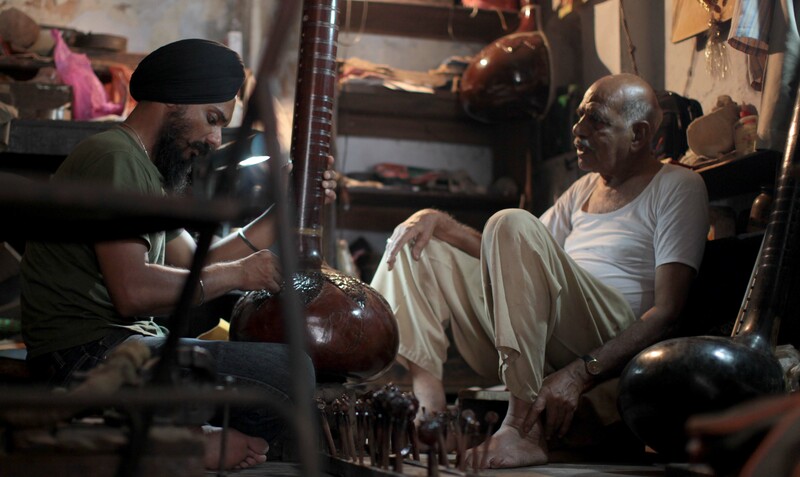 As a unique feature this Punyā (full moon), Bhai Baldeep Singh will exhibit tools of his luthiery maestro, Gyani Harbhajan Singh Mistri, and Sri Hari Chand (an associate luthier and younger brother of the legendary Kartar Chand). Additionally, Bhai Sahib will exhibit his own luthiery tools and some of the instruments in the making. If you would like to support the work of the Anād Foundation, the Anād Conservatory, and this concert series, donations are tax-exempt per 80G vide order No DIT(E) 2008-2009/T-1184/1659 dated 5th September 2008 of the DIT(E) New Delhi. Cheques may be signed in favour of “THE ANAD FOUNDATION”. A report in Punjabi vernacular, Daily Ajeet, by Narinder Singh Sonia on October 28, 2012. Hari Chand. Photo by Manpreet Singh Khalsa. 2012 10. Hari Chand with Parminder Singh Bhamra. Photo by Manpreet Singh Khalsa. 2012 10.